International School Award - 10 years old. 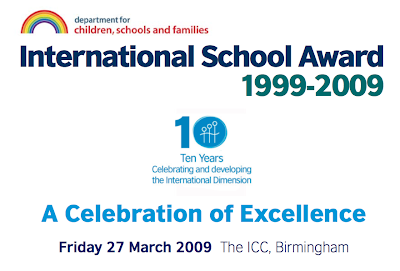 Today I attended The International School Award - Celebration of Excellence at Birmingham's ICC. Lots of people attending came from schools that had achieved the Full award three times and there were prizes for them this afternoon. One school is unique in having achieved it four times in the 10 year history of the ISA. There were lots of inspiring speakers, from schools, from management, from national organisations and even from the BBC. Here are some of the thoughts I managed to get down! David Garner from QCA spoke about the International Dimension in the context of the new curriculum, sharing how it is deeply entwined and embedded into both the secondary and primary context. We want to develop young people who fit the criteria on the right - how will we do it? David commented on how a project in India impressed visitors who commented that it was resource poor, activity rich - in our country, so often the reverse is true. shared that the ISA is all about children. And demonstrated it by bringing some of the pupils to share their experiences. and then developed into their own At Hillside High School, international links started with European Studies project 1986-1992 and developed into their own project - Czech Mates before in 1997 Comenius emerged followed two years later in 1999 by ISA. young lady talked about a poster / banner collaboration between Sefton and Slovakia - using Skype and Adobe Photoshop. A young man talked of an international maths seminar - held in Sefton with several nations represented, solving maths problems together. And Danny Murphy - not the footballer!- reported on radio days, a four hour show that went out over the Internet to many countries - it was lots of work but great fun. Carlton Digby is a small special school in Nottinghamshire and two of its pupils, Luana and Mia delivered the presentation beautifully with details of their activities such as China Day, raising money for a water pump at a school in Uganda, visits from other countries. 'We had lots of fun!' was the phrase that jumped out at me, especially as they taught us a song (see photo) with signs! Kevin spoke very charismatically about the profound effect of the International dimension and specifically the ISA on teaching and learning, and how in his experience it has helped improve standards as well as the lives of the kids with whom he was working. Paul Keogh MBE, described by Feargal Keane later in the afternoon as ‘the Peter Kay of language teaching’ is Head of Languages and AST at King James’s, Knaresborough, North Yorkshire. He woke us all up after lunch with braingym in French, the alphabet march and airwriting with hands, noses and bottoms! Very amusing! Maggie talked about how at home as a child she had an international environment (her parents are from British Guyana )but at school not. Education saw people who were different as a deficit - lost to learning. Maggie related the story of Mrs Jefferys, one of her primary school teachers who tried to make her feel part of the class by using Anansi stories and getting Maggie to read. She;d made assumptins that weren't correct but her intentions were good. It wouldn’t happen today - teacher wanted to include but went the wrong way about it. Over the years, language and action has evolved. Her next anecdote came from the opening of the Wallace and Gromit exhibition. As the doors opened, it was the adults who ran through the exhibition not the kids. ADULTS playing - going back to themselves and enjoying playing. Maggie believes that the ISA has enabled us to play again - to do fun things like drawing with our backsides!! Finally, Maggie talked of how people used to find it hard to get a handle on her- nowadays she is less likely to find comments in playgrounds about differences. She was recently in a museum about to start a PDA search. The kids had done it first and interacted with one another about their learning. Maggie asked a child how to cheat and fnish quickly to which the child said 'but why would you want to cheat? It’s about learning!' Through the ISA we’ve allowed kids to be honest about what they do and think. He then read a poem, All of these people by Michael Lumley that he had carried around in all warzones that raises the question - who can bring peace to people who are not civilised? Feargal spoke of an idea of interdependence - of homes, communities and a world where people recognise their dependence on each other not just for money or food, but a mutual dependence where we recognise and see shared humanity and grasp it in every way we can, putting the ideal of that poem into practical effect..
power of media leads to conspiracy theories which kids believe. And if kids are not taught to question orthodoxy and what is in front of them, they won’t be able to take responsible decisions. (At the same time he did acknowledge that this needs to be balanced with need for authority and discipline in schools!) Feargal said that he is worried by negative views of young people in the media, the constant stereotyping of them as yobs as if you tell people enough times, they’ll believe it. He suggested that there is a need for a greater willingness to listen to voice of the young people - what do they have to say? - as he spoke passionately of his experiences in South Africa and of contact with a Cameroon pygmy village. Feargal Keane is well known for his coverage of the Rwandan genocide, and it is obviously something about which he will always speak with great passion. He pointed out that one reason it happened was b ecause the education system was corrupted- for example, Tutsis made to stand up throughout history lesson whilst Hutus were told that Tutsis were evil. The genocide was described as ‘claustrophobic airless hell’ with a million killed in 100 days. Feargal then told us the story of Valentina who hid and survived under bodies of her parents for weeks after the neighbours killed her parents and her brother . She had been severely wounded and was very very ill, but alive - just. Three years later, he went back to find that she had survived. A video was made of the story for the BBC, and that video caused many many schools to contribute to set up a fund for her education. She was sent to High School and two years ago Valentina came to London to speak at genocide memorial day and made a confident speech. She is now at University in USA, speaks fluent english and is doing medical studies to give back to her community. Feargal's point was that people who sent that money made all the difference in the world to that child. You can’t change the world on your own but we have a human obligation to make the attempt and reach out to one individual to make a connection. No man is an island - we are all part of the main. Politicians move on becasue another thing cmes along demanding their attention, but we have to keep on at it. As educators, we have a social responsibility - the need to enable kids to make informed decisions - to illustrate this, Feargal gave the example of one of his teachers, Jerome Kelly who gave 2 lessons RE and 3 of philospophy instead of the 5 of RE he was supposed to teach. 'People are people because of other people. I think that is the message I'd like to conclude on, but a small postscript. Following on from this, there was a presentation for schools that had achieved the ISA three times. And one of my abiding memories of the day will the girl from Carlton Digby school ( i think it was Luana!) who, rather than settling for the sedate walk and handshake favoured by others, was so excited that she ran across the platform, launched herself at Feargal Keane and threw her arms around him. And he didn't seem at all phased! a lovey moment! ¡Pocoyo y la hora del Planeta! I'm a great fan of Pocoyo - just a shame that Stephen Fry doesn't do the voiceover for the Spanish version. In the following video, Pocoyo encourages us to join in with La Hora del Planeta. Tomorrow from 8.30-9.30pm is Earth Hour - when we are encouraged to switch off the lights and vote for the Earth. A cute clip with a worthwhile message that little things - and little people! - can make a big difference. Following on from my 30 minutes on the International Dimension on Tuesday, the assembled group were treated to a session led by Pam Haezewindt, HMI, on inspecting Primary Languages. Here are some of the points, comments and observations that she made. issues arising from the school SEF and preinspection briefing may be investigated, so PMFL may be visited to probe generic points eg behaviour. Pam pointed us towards the following document which can be downloaded from the OFSTED website using the number quoted. Subject inspections are carried out as part of the survey inspections OFSTED is required to do. These are inspected according to the headings of section 5 schedule but each subject also selects an issue to look at in more detail. One third of schools identified were not visited because they had not begun languages, or, significantly, had begun but stopped due to staff leaving. These schools have all been telephoned this term and only two have not now introduced a language. 2007-8 - what has changed? the large majority teach French, 30-40 minutes a week, plus some extra provision. In 2008-9 the key issues under consideration are entitlement and curriculum models. 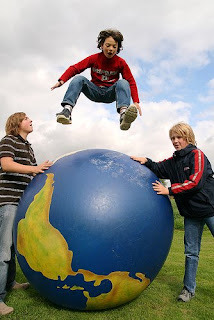 A language is to become compulsory in primary schools from September 2011. 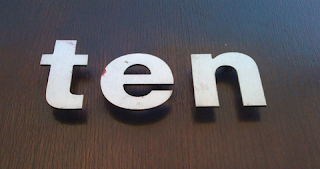 (Not to be confused with 2010 deadline for entitlement!) The children who are currently in Reception will be the cohort with compulsory entitlement. Current debate about which and how many languages is ongoing. I found all this information really useful and hope that it will be useful to others too. Going to the article to investigate further, it refers to the Rose Report's recommendations about an increased use and understanding of technology for Primary school pupils, and a separate recommendation about history and the ability to opt to not teach World War 2 and the Victorians. "Sir Jim Rose's report has not been completed let alone published yet - but we are already getting stories about dropping this or removing that from the curriculum. "Of course pupils in primary school will learn about major periods including the Romans, the Tudors and the Victorians and will be taught to understand a broad chronology of major events in this country and the wider world. I've also embedded a video of the hands from one of our International projects, Hands across the World. 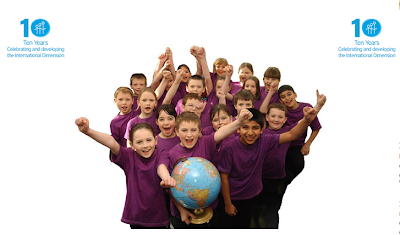 And I've added the presentation on WCPS' winning eTwinning project. Sorry I was unable to talk about it at greater length but hopefully you can find out more information from the Slideshow. If you have any questions, feel free to leave a comment or email me and I'll try my best to help! I'm a great one for writing songs and little ditties to help children (and those slightly older!) learn languages. We've had Diez animales to the tune of Ten green bottles, Hace sol y hace calor to Half a pound of Tuppeny Rice and ¿Quieres un helado? to a random (very annoying!) tune I composed myself. It seems that some of my songwriting (dis)ability has been passed on in the genes as my eldest was inspired to song by Tottenham beating Chelsea on Saturday. Odd, as he is a Man Utd. fan , but his Dad and little brother are Spurs fans so I guess it is explicable. Very catchy, I have to say. I had a most bizarre conversation at the Primary Language Show a fortnight ago. There I was with Jo Rhys-Jones eyeing up the new puppets on the Little Linguist stand when one of the staff exclaimed - 'Oh, Lisa! Did you win the calendar in Birmingham?' I replied that I did indeed - as part of the Birmingham Primary Language Conference in November! I'd almost forgotten as I had never received said calendar. Catherine (I believe it was!) responded that she was very sorry I hadn't received it yet - they (Little Linguis t) knew that there were two winners but had no idea who had won. Apparently, they found out from my blogpost about the conference - how cool! And 3CT thank you too as they have now got a calendar just like 3DS to help them with their current unit of wrk which is all about....dates! Great excitement last week when a parcel arrived from Devon, with a courtesy slip from Devon Education Services. Our copy of TAKE TEN EN ESPAÑOL has arrived! As you may recall, I was asked to help out along with some of the pupils at Whitehouse Common Primary School where I teach. The kids have been eagerly awaiting the finished product and are very excited to see how it's all turned out. As the blurb on the DES site says ..
Take 10 en espanol is a resource that helps primary school children practise their Spanish in a fun way whilst taking part in short tasks of daily physical activity. In doing so it brings together two major educational initiatives and offers the potential to significantly improve children's learning potential. A follow up to Take 10 en francais, Take 10 en espanol has all the features plus extra dance section with Salsa and Flamenco. I'll be using a song from it with Year3 on Thursday - San Fermin. Happens to fit the topic we're doing - and serendiptously, it's one of the ones that WCPS dance on the video! Hot on the heels of CILT's Primary Language Show, Birmingham's ELL RSG meeting at the Martineau Centre in Harborne on 9th March was led by Helen Leigh from Worcestershire LA and was full of ideas for five to ten minute language activities that can be done in the classroom. Whilst the recommendation of one hour per week language learning has been understood as a discrete lesson by some, the ideal is that the hour is spread throughout the week. Not only because an hour is a loooong time to maintain attention and energy, but also because little and often fits well into the already packed primary curriculum. Helen suggested the term 'language exposure' too as a good way of viewing it. The session was jampacked wth ideas which Helen related to the KS2 Framework. 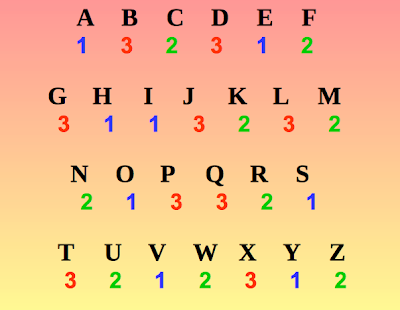 Kids could make up their own versions, have a competition to see how fast they can do it correctly? It also fits the idea of Daily Physical Activity. See also Take Ten en français / en español. 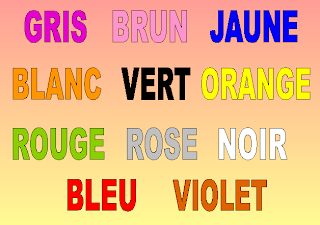 b. colours - Dr Kawashima-like stroop test - as a timed test perhaps, or inter table competition? Another idea was a Mexican wave of word cards and/ or pictures? focus on ‘ou’ sound - touch your head when you hear the sound. This also covers ICU as traditional song. Helen reiterated that it is not necessary to understand every word. A simple activity - two pupils compete to splat the number, animated on PPT to pop up and down. Make it harder by asking pupils to splat multiples of 3 for example. Fishing rods - hook a fish - on the back of the fish is a number - the team that gets the number closest to x that wins. Add them orally! Alternatively, make it harder by allowing the use of all operations to reach a more difficult number. Helen also showed an idea using an alphabet mat - give two people a word to spell out by 'dancing' on the letters. their partners cmpete to write the word phrase down. Another idea was to ask questions with three possible answers. Someone is sent out. whilst they are outside, the group decide on the correct answers. When they return, the person has to get all three right or start again. This allows the class to practise the question form which the part they often struggle to learn. Helen then showed us some magic! Dice that changed colour, books that lose colours and regain colours, disappearing things, psychic displays - all the usual stuff! We then had a look at the story Je m’habille et... je te croc! all about a wolf who gets dressed then comes to eat us! 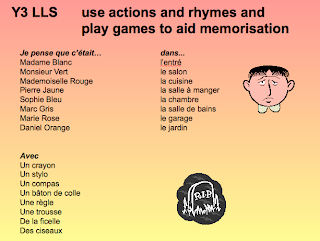 Helen had found a Powerpoint in French already prepared - there are lots more great ideas on the site too! The final activities involved the Months of the year - firstly, using a mgaic bag - everyone wrote their birth month on a slip of paper and put them in a bag. Helen then got someone to choose a month and wrote the month that she thought it would be on a magic board. of course she was right as there was a secret compartment n the bag! The other activity involved betting on the month that disappears forst from the board, then, once they've all gone, which comes back? The disappearing involves pupils copywriting on a whiteboard, and reappearing involves recall. This time last week I was starting my second afternoon of speaking at Primary Language Show in Liverpool. In three weeks time, I'll be listening to, well, I can't decide! It could be Rachel Hawkes, it could be Alex Blagona on wikis and it could be Pippa talking about a cross curricular French / Tudors project. As usual, Language World, the annual conference of the Association of Language Learning (ALL), is packed full of great sessions. Spread over two days - Friday 3rd and Saturday 4th April - and taking place at Leicester University this year, the conference as always has something for everyone. From trainees to PhDs, from Primary languages to Further education - all will find something to satisfy their needs. There's a primary strand this year which is great and special rates for Primary teachers - whoop whoop! And the opportunities for meeting new people and networking are great too. I love Language World because there are always sessions that really challenge my brain, something that doesn't always happen in CPD. Why not have a look at the ALL site, download the PDF and check it out for yourself. I'm speaking on 'Absorbing ideas for Primary languages' so it would be lovely to see you there. if not, I'll publish my presentation and resources here, and of course, add the audio to Lisibo talks! In order to make a Slidecast, you need to have a URL for the audio you want to synch to your Slideshare. So, the easiest way was to use Podomatic as I knew how that worked. My first Slidecast - Ten top tips for Primary Language Learning - was created with the kind assistance of Joe Dale who saved the audio for me and emailed me the link, but I like to do things for myself and was determined to sort it all myself this time. And, as I was putting the audio on Podomatic, it seemed silly not to publish it as a 'podcast'. A quick update on the presentations from the Primary Language Show in Liverpool. Last week I published my presentations Join El Carnaval de los Animales and You and Youtube via Slideshare, and embedded them on my blog with other resources from the talks. I recorded the sessions on my trusty 'Toblerone' aka my iRiver, and, as I was off work with a sick son this Thursday, I had time to edit the audio using Audacity and the Levelator. I then linked the audio to my Slideshare, synched it to the presentation and published it on Slideshare as a Slidecast. So if you now go to the blogposts, or to my Slideshare page, you will get the audio too! Magic! 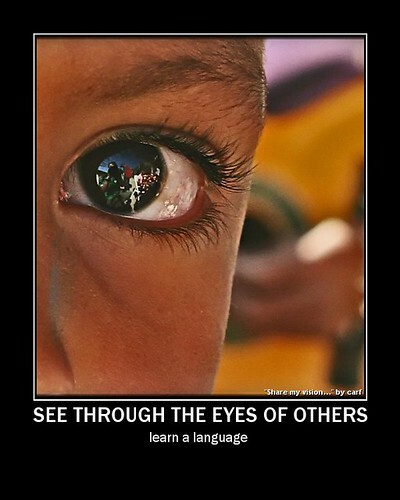 Learn a language - see through the eyes of others, originally uploaded by acjeppo. Beautiful photograph - and such a true statement. From the home of Coffee Break Spanish, School Run French, One Minute Languages and Showtime Spanish comes a brand new, one off podcast mini series in aid of Comic Relief. 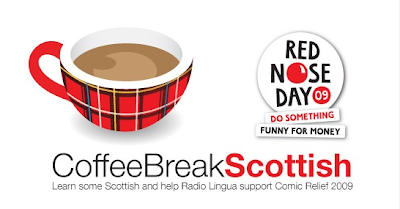 Urged to 'do something funny' this year, Mark and the Radio Lingua team have responded to frequent comments about their Scottish accents by producing a three part series entitled CoffeeBreak Scottish in which they teach us some basic Scottish phrases. It is a tongue in cheek look at how people speak in Scotland, not a course in Gaelic and as Mark says.. 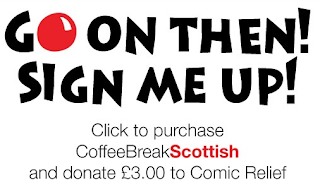 So, if you want to know what 'ah havnae a scooby' or 'it's baltic oot there' mean, why not pop along to http://www.coffeebreakscottish.com/ where, for £3, all of which goes to Comic Relief, you can downlaod the three episodes covering basic greetings and useful words, eating out, and making arrangements. And, as a special treat, Radio Lingua are offering a voucher for 25% off any future purchase of a language course from RLN. So, if you enjoy CoffeeBreak Scottish, you might like to explore the catalogue of equally excellent but less tongue-in-cheek podcasts they produce. Fairytales and Fables using thinking skills. As I admitted to Louise when I saw here later, I've used the resources on the NGfL, specifically Goldilocks and Little Red Riding Hood in Spanish, and have made use of some of the activities discussed during the session without really grasping the full power of them. So it was good to discover the thinking and theory behind it all. This has implications for thinking skills - Louise opened by reflecting that learning should be active, meaningful, challenging, collaborative, mediated and reflective. She talked about Lev Vygotsky and his zones of proximal development. Vygotsky felt that it is children's interaction with others through language that most strongly influences the levels of conceptual understanding they can reach. He also believed that we can learn from others, both the same age and of a higher age and developmental level - learning is a social activity and thinking skills could be the road to better language learning. and the scheme of learning activities that Louise was presenting follow this pattern. At each stage, opportunities are given to explore concepts behind the knowledge in an unthreatening manner. short phrases - I understand simple word order. By using scaffolding early on, pupils in PMFl can reach level 5 equivalent skills. Louise questioned why, if pupils are conceptually able to reach level 5 in Maths science and Literacy, we limit them in MFL? 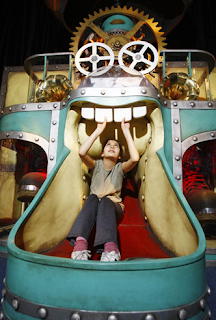 By moving from fairytales to fables the pupils are moving from familiar to less familiar stories with more complex language. Ricciolodoro è i Tre Orsi was the first story in focus. We did an activity in which we were exploring gender - not being taught it but discovering it. If you present ‘the cognitive conflict’ children discover for themselves and it much more powerful than being told. We began loo king at the activity Map from memory, a visual, walking dictation type of activity in which we were communicating the position of items in a picture from memory wthout touching. The key was - How did we tackle the task? Were we methodical and divide the picture into sections? Did we look for likely places to put words? Did we match adjectives in advance of instructions? We then moved onto the construction of phrases and sentences using a grid, then joining with connectives. Although some may not be strictly correct in terms of likelihood or sense, in the feedback you get quality of language. Louise emphasised that the teacher's role is facilitating in thsi scenario rather than giving learning. In this exercise, the thinking was interpreting and oragnising info whilst the children were talking about how to work together as a team - team strategies lead to spontaneous language. The next activity involved a Venn diagram which we used for making deductions about adjectives. Conclusions reached included that you often add an e to make feminine adjectives and ones that are the same end in e already. The exercise then gave opportunities for more sentence making opportunities. Sadly Louise ran out of time to explain the Fortune line and Fact or fiction, but we did have a quick look at classifying verbs, matching infinitives to verb forms and then splitting the verb cards as we saw fit. We were encouraged to split them into description and action verbs, and then to discuss our conclusions. The interactive stories and SMART notebook files of characters and for retelling the story are available on the NGfL website and the accompanying resources are available for purchase £149. I've used the Goldilocks stuff in Spanish very successfully with Year2 who discovered all sorts of things about language through it. And now I understand why!! For those of you who read my post a while back about the One Semester of Spanish Love song, you'll be pleased to know that Mike hasn't given up on wooing his 'chica'. Now, with another semester (term) of Spanish behind him, and with a little help from a friend, he's back with the Second Semester of Spanish Love Song. In honour of the big match tomorrow night and in honour of Scousers everywhere, a short video! Here's my presentation from my Saturday session at the Primary Languages Show in Liverpool entitled You and Youtube. The idea of the session was to give people ideas about how Youtube can be used in Primary Language Learning (PLL). We looked at alternatives to Youtube, how to use video clips if a site is blocked by downloading via one of a number of tools and of course, ideas of suitable clips to use and how they might be used to meet bjectives in the KS2 Framework. As the movies included in my Keynote presentation were embedded, I have had to go back through the presentation and hyperlink to source sites. So if the title is not hyperlinked, click on the picture or black squarea nd you'll be taken to the original! Here are a couple of clips I showed that weren't in the presentation. spanish food song from janet wisner on Vimeo. If you have any comments / questions, please feel free to leave them below, or e-mail me! I was very privileged to be invited to present this year at the Primary Languages Show in Liverpool, not once but twice! I promised at my two sessions that I would post my notes and resources on my blog for people to download and use. I have blogged this unit previously here and you will find my worksheets, the SoW and more ideas here and a fuller description of how we animated our animals here. 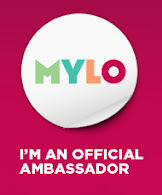 If you've got any questions, feel free to leave a comment below! As I write, it's Day 2 of the Primary Languages Show and I'm in a really interesting session by Louise Harty from Northumberland who is talking about Thinking skills in Fairytales and Fables - blog post to follow! As promised, I'll be blogging my sessions and uploading the resources to which I refer so if you were in Liverpool and want the resources, they're there, and if you weren't in Liverpool, you can benefit too! Any questions, feel free to ask. I'll also try to blog the sessions I attended - really interesting they are too! and I'm hoping to cadge some notes from others too! This afternoon I had the pleasure of meeting up with a number of educators - teachers and advisors - who shared an interest in eTwinning. 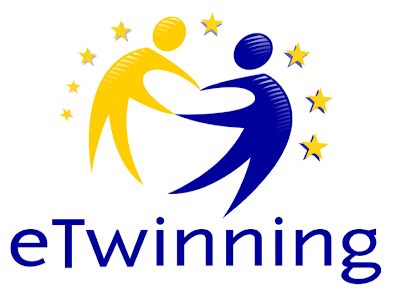 I had been asked by the lovely Isabel Lalsingh of the British Council eTwinning team to present a short case study of my eTwinning experiences and this I was pleased to do. Good to see Isabel again, to meet Andy Tromans having heard his name mentioned numerous times, and to see @spookingdorf aka Dale Jones - that was a surprise! And of course to meet eTwinning fans new and old! Below is my presentation in its entirety - it isn't on its side as I had feared ;o) If you need any help, feel free to contact me.